That was too cute a title to give up. At a surprisingly young age, human babies are aware of their surroundings and the emotions around them. They can even tell when a dog is being friendly or aggressive. That’s a good trait considering that we’ve lived with dogs for at least ten thousand years. I once read that cats and dogs were commensals (ate at our table); both had jobs to do (cats hunting rodents, dogs warning, hunting, herding, guarding, antiwolf-wolf, etc.). Animals kept and tamed for meat, milk, wool/hair, hides, bearing burdens are domesticated. Animals kept for fur are mostly wild animals kept in cages. The one attempt to breed more docile foxes also gave them neotenous traits like floppy ears and spotted coats. That breeding program, 40 years old or more, is still struggling along despite a desperate lack of funds in the former U.S.S.R.
Oddly no one seems to have taken credit for domesticating the pig, unless it’s the farmers of New Guinea. At least one author hypothesized that they just moved in with us as equals. I understand that a ferret is a domesticated polecat(?). But when we consider the odd friendships that animals sometimes form with each other, it’s not surprising that almost everything has been kept as a pet/friend/household member. black rat, originally uploaded by monado. 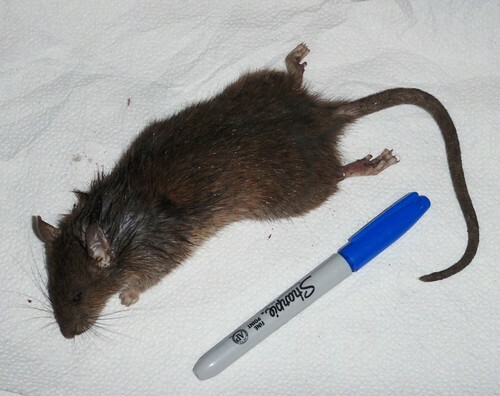 This is a black rat, also called a roof rat, brought in by one of my cats. I don’t usually mention them because usually I find half a rat–the front half. It weighed 182 grams (6 ounces). Yes, I weighed it –why do you ask? Black rats look a lot like giant mice. Norway rats or brown rats, which came from Europe on wooden ships, are much larger with a shorter tail and shaggier fur. The Economist cites an experiment that shows that a chance to learn human behavior, not intelligence, is the key to understanding human gestures. An experiment that concluded dogs understood gesture better because of selection to understand humans was flawed. 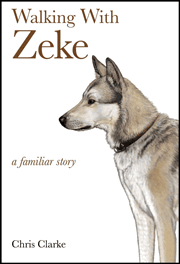 It used wolves that had not been raised with humans. A second experiment found that wolves brought up by humans understand gesture better than do dogs. My long-haired cat is coming in with “devil’s pitchforks” stuck deep in her fur and she doesn’t like anyone removing them. I have to catch her at a sleepy moment, hold her down, distract her, or some other stratagem. At least these I can pull out. A few weeks ago, she was finding little round burrs that I mostly had to cut out of her fur. I’ve seen the “pitchfork” seeds before but didn’t know the plant. It’s an evolutionary strategy for burrs and hooked seeds to catch in an animal’s fur and be carried away from the parent plant. Wherever the animal grooms them out, or where they catch on something else, is the seeds’ new home. Finally I got curious and looked them up. Surprise! I knew the plant. It’s a weedy-looking thing like a small sunflower or a daisy without the big petals around the edge. Now that I know them, I’ll pull them up before they go to seed. The culprit is Bidens frondosa. The common name is Devil’s Beggarticks. But where I grew up, we called them Devil’s Pitchforks. 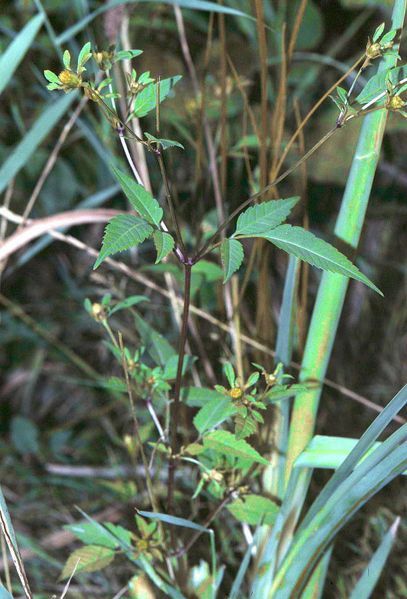 The weed is also called stick-tight or largeleaf beggarticks. There are more pictures here. and here. It’s a plant native to North America. Keep an eye out for them next summer. Dogs likely were the first animals to be domesticated and as such have shared a common environment with humans for over ten thousand years. Only recently, however, has this species’ behavior been subject to scientific scrutiny. Most of this work has been inspired by research in human cognitive psychology and suggests that in many ways dogs are more human-like than any other species, including nonhuman primates. Behavior analysts should add their expertise to the study of dog behavior, both to add objective behavioral analyses of experimental data and to effectively integrate this new knowledge into applied work with dogs.